Bedhead Pajamas, online at BedHeadPJs.com, is the best source for women's, men's and kids' fun prints and luxury PJs alike. Check out their selection of cotton, luxe, flannel and knit pajamas. BedHead Pajamas also offers robes, loungewear, nightgowns, nightshirts and maternity pajamas. Create a personal haven at your home with candles, slipper and luxury bedding from BedHeadPJs.com. Keep warm with slipper booties and slipper mules. Don't forget that RetailSteal.com always has the best BedHead Pajamas coupons, BedHead Pajamas promotional codes and BedHead Pajamas savings. Free shipping on qualifying orders over $200. BedHead Pajamas ships at a flat rate of $8.00. Make return within 30 days of purchase for a refund. See website for full details, exclusions may apply. 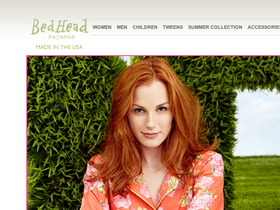 Use this exclusive Retail Steal coupon code to save 15% off your purchase from BedHead Pajamas. Click link to shop. Use the coupon code and take 20% off your online order at Bedhead Pajamas. Click link to save. Save $25 at Bedhead Pajamas on any $175 order when you use the coupon code and get free shipping. Click link to shop. Shop at BedHead Pajamas and enjoy free shipping on all orders using this coupon code. Click here to shop. Buy 1 get 1 25% off BedHead Pajamas with code. Click link to buy. Get a free cosmetic case when you order $125 or more at Bedhead Pajamas with the coupon code. Click link to shop online. Save up to 55% on loungewear, pajamas, and accessories in the BedHead Pajamas sale section. Click link to shop.